Testimony to a Senate committee from Australia’s People Smuggling Ambassador, Andrew Goledzinowski, has confirmed the scale of uncertainty that surrounds the US resettlement deal. 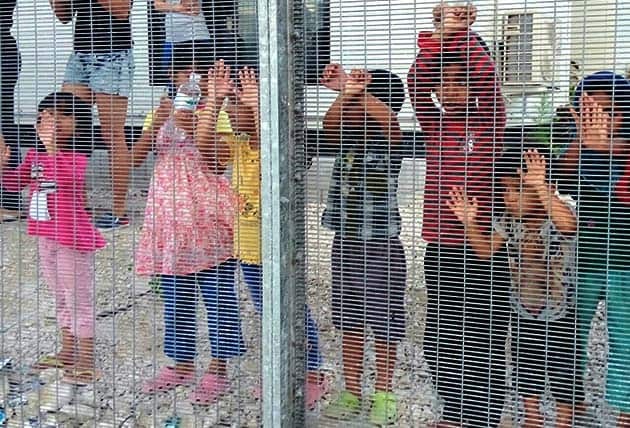 Goledzinowski told the hearing that under the deal, the US could resettle no-one from Nauru or Manus and still argue it has honoured its deal with the Turnbull Government. The revealing admission comes in the same week as Amnesty International stepped up its call for the camps on Manus Island and Nauru to be evacuated. Amnesty stressed all the points that the movement has been making about the US deal: there is no time frame for resettlement of people who have already been imprisoned on Manus and Nauru almost four years; there are not enough places to ensure that all the refugees can be resettled and there are no plans for the hundreds who will be left behind even if the deal goes ahead. Families that are already split between Australia and Nauru will be permanently separated by the deal. They have begun daily protests at the detention centre gate but with the US flag now painted out of their banner. Meanwhile, US President Trump has issued another executive order with yet another four-month ban on any refugees entering the US, and no one is saying if that affects the refugees on Manus and Nauru. In any case, some refugees on Nauru had their first US interview four months ago and still do not know if they are accepted or not. A new notice being circulated on Nauru says that US officials from Homeland Security will be coming to Nauru to collect fingerprints from all those who “expressed an interest in resettlement”, for an initial security check. But there is nothing to say who has been selected or when there will be future interviews. US officials left Manus in March after interviewing around only 300 refugees. Nobody is saying when they will be back. But the hundreds of refugees who were not interviewed are left wondering if they are even going to be considered. The Australian government has no plans for those who will be excluded from resettlement in the US. Immigration Minister Peter Dutton says resettlement is solely an issue for the PNG government, although the agreement between PNG and the Australian government that put them there was declared unlawful by the PNG Supreme Court a year ago. Since then however, attempts to use the PNG courts to enforce its ruling have proved fruitless. In early March, this year, an application for an injunction to prevent forced removals from Manus was dismissed by the Supreme Court. A week later a Lebanese asylum seeker was forcibly returned. Lebanese asylum seekers are being offered $30,000 to sign to return “voluntarily”, $5000 more than the Nepalese. But each forcible removal escalates the level of anxiety and intimidation, and turns the screws on others to sign to go back. Yet pressure is building on the PNG and Australian governments. Ferrovial’s contract ends in October. There is no realistic prospect of PNG settling the refugees. The Australian government is content to let them rot. And the ravages go on. At least three refugees have been medically evacuated to Australia from Nauru as an epidemic of dengue fever sweeps the island. And the bashings and muggings continue, although less and less reported. But the need for the political campaign is an urgent as ever. A year ago, hundreds of people with the support of the trade union movement in Queensland blockaded the Lady Cilento hospital in Brisbane to prevent baby Asha and her parents being sent back to Nauru. Well over 300 asylum seekers and refugees from Manus and Nauru are still in Australia because of the defiance of the refugee movement. The Turnbull government systematically uses refugees as scapegoats for its failed policies and to whip up concerns about national security. At the end of 2016, Turnbull told the UN that Australia’s border protection policies (that means, boat turnbacks and offshore detention) “were the best in the world.” In January, Foreign Minister Julie Bishop emphatically declared that the Turnbull government would support Donald Trump’s “strong immigration and border protection policies”, despite their condemnation by the rest of the world. As various European governments copy Australia’s policies by expelling asylum seekers and countries like Hungary resort to mandatory detention, refugee supporters and anti-racist protesters have taken to the streets to demand that Europe opens its borders. (see p11). To keep up the fight against Turnbull and Hanson and to break Labor’s support for offshore detention, we need the refugee rallies on 9 April to “Bring Them Here” to be as big as possible.